A refugee life is always one of marginalization, hardship, and fear. But when the refugee is a child, the marginalization is amplified manifolds. Not only does the child face geopolitical atrocities and a childhood stolen, there are few places worse for a child than a refugee camp. While the lives of refugee children are saved when in these camps, they are deprived of their basic human necessities that enable their physical, emotional, and psychological development. The Rohingya children are living proof of that. The influx of Rohingya refugees in Cox's Bazar of Bangladesh has left humanitarian workers therein short-staffed and under-resourced. While the governmental and non-governmental organizations are trying their best to provide the basic necessities of life for the refugees, they are often falling short to ensure a decent quality of life. One example of such shortcoming in the quality of life provided for these refugees, is the education and emotional support the kids are getting. While there are schools for the Rohingya children, these often lack learning material and the teachers often fail to provide the children the emotional support that they need. Sterling5 Foundation has identified this vacuum in the system and has taken the initiative to make amends. 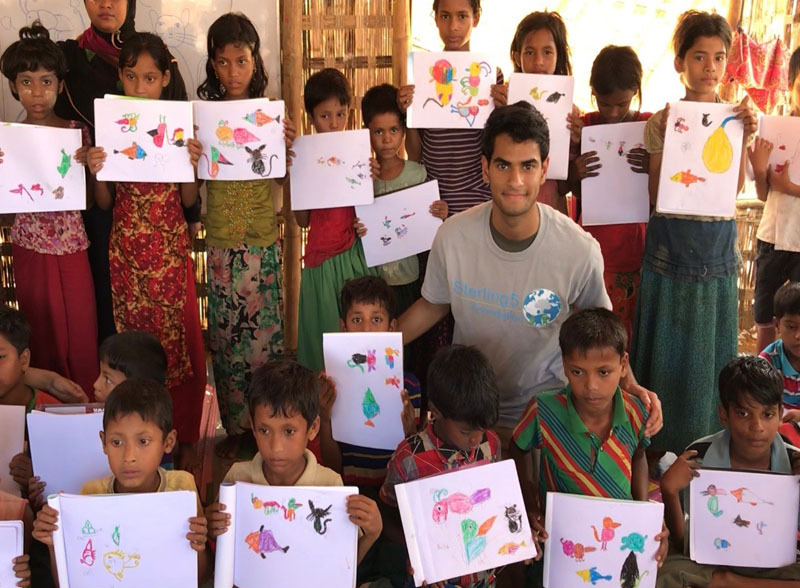 Under the lead of Fian Sama, the founder of Sterling5 and collaboration with Change, an initiative for green innovation, and Canvas Bangladesh, a community engagement project was carried out in Sector 4 of Kutulapong Refugee Camp. The volunteers of the organization visited 5 schools in the camp and provided 150 students with art supplies and stationaries. Recognizing the power shortage in the area, and 20 units of solar lamps were donated to teachers of the school and volunteers. The volunteers of Sterling5 Foundation primarily led the venture to Kutulapong Refugee camp. During the 3-day event, the volunteers spent time with the school children drawing and providing emotional support.